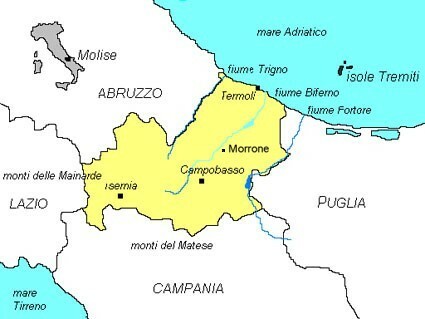 In 1963 Molise separated from Abruzzo to become an independent region. It is divided into two provinces, Campobasso and Isernia, and its territory is composed of areas that differ widely from each other morphologically as well as historically and anthropologically. Molise can be reached by car (A 14 motorway: Pescara-Bari, A 1: Rome-Naples and A 16: Naples-Bari) or train (Rome/Naples-Foggia line; Vairano/Caianello-Campobasso; Carpinone-Isernia-Pescolanciano-Sulmona line and Bologna-Bari line).